As temperatures continue to rise, it is clear that summer is clawing its way back into Southern California. Summer- the favorite season of most Californians. We dust off out bathing suits, prepare our grills for family get togethers, and dust off our outdoor furniture in preperation for fun months ahead. If your backyard includes and inground pool, then prep work for you can be especially taxing. No matter how crystal blue you get the water of your pool, if your pool deck looks dingy or dull, then your entire pool area will follow suit! To keep your pool deck looking great, you should do an annual pressure wash, in addition to applying a coating or sealer to the pool deck every 2-3 years, especially if you have a salt water pool. This coating will rejuvenate the concrete, restoring its original lustre and shine. Additionally, this will help to protect your pull deck from discoloration due to leaves, UV rays, or spills, and will even make it more slip resistant! This is, by far, the most labor intensive part of the entire application process. Before a coating can be applied to the concrete, the existing concrete must be completely devoid of any dirt, grit or debris. To do this will be a three step process: Cleaning, Treating, Filling. You should then treat the surface with a Muriatic acid solution. This will remove any further grease that you can’t see and prepare the surface for the new pool deck coating. Follow the manufacturer’s instructions when you are mixing the solution. Use a still broom to push the acid solution over your existing concrete area, as this will work it into the cracks. Hose off the concrete with water once you have applied the acid solution. You can apply coating to a pull deck like paint, which makes the process of actually coating the pool deck very simple. Do not apply the deck coating if there is a possibility of rain or bad weather during this time or this may affect how the coating dries. Easy process, big results. 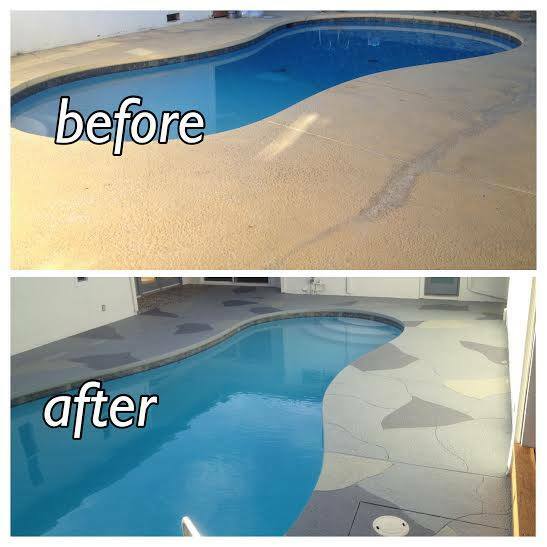 Summer is here, get your pool deck shining like new without the hassle of resurfacing the concrete! Concrete Driveways, Decks, Fire Pits, Outdoor Barbecues, Pavements, Pool Deck Repair, Step Stones, and Walkways.